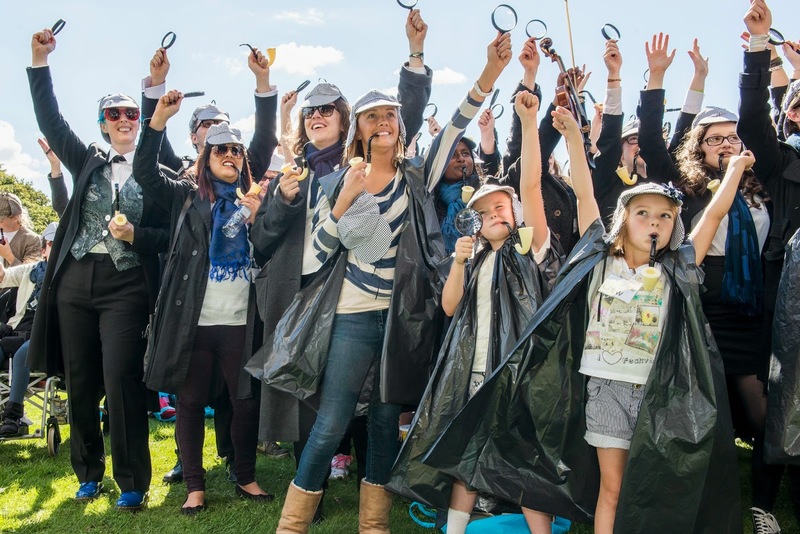 Yorkshire beat the Guinness World Record for the Most People Dressed as Sherlock Holmes today (31 August) with 443 gathering from across the UK dressed as the detective. In a dedicated Sherlock Festival, with music, dance, circus, funfairs and cosplay, hundreds of people dressed in deerstalker hats, cloaks, with pipe and magnifying glass, did a collective Sherlock mob dance to ‘Staying Alive’ putting a modern twist on the Victorian detective. The dance included the theme tune to the BBC Sherlock series, shuffling to the left then the right. On a glorious sunny day at Temple Newsam, there was a sea of dancing Sherlocks, at the end of the Record, they sang along to ‘We are the Champions’. The last World Record attempt was in London – Yorkshire trebled the number collated in the capital (113). Sherlock and Dr Who writer STEVEN MOFFAT and wife, TV Producer SUE VERTUE, sent a video message of support for the Sherlock World Record, which was met with cheers and applause. They donated a BBC Sherlock script which was signed by all the cast, including Benedict Cumberbatch, and writers, for the best dressed Sherlock. The winner was Christian Whitley, 12, from Leeds. A dropbox message of support from Steve Moffat and Sue Vertue was also received. The attempt took place at 2.30pm. 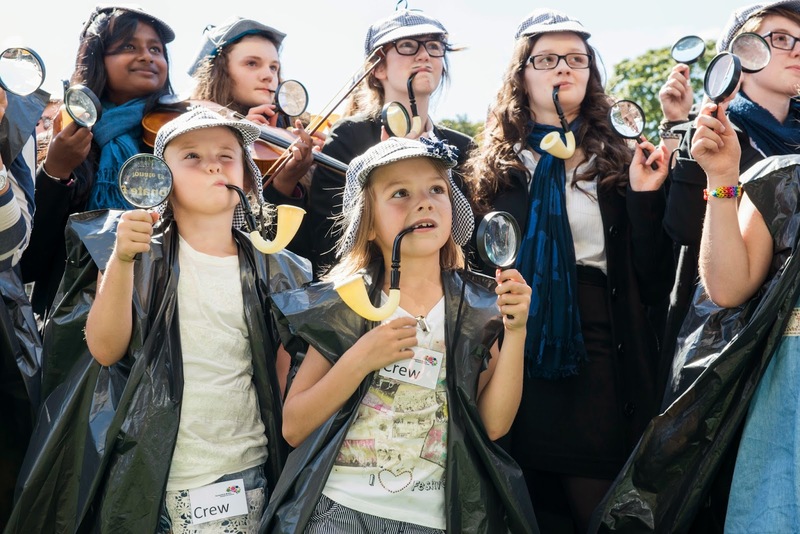 Sherlock Holmes, one of the most popular consulting detectives of all time, is on the case to help raise money for one of Europe’s largest teaching hospitals - the Leeds Teaching Hospitals – to help raise funds for a new Yorkshire Brain Research Centre. participant received a Deerstalker hat, pipe and magnifying glass on the day of the event for an entry fee of £15, all proceeds go to the charity. The minimum number of people required to set a new Guinness World Records title is 250 participants. The event, hosted by actor and comedian Neil Grainger, included a big stage featuring comedy, music, dance, cosplay, circus and theatre, and a fun fair. The event has galvanised world-wide support with donations from Chile, France, USA, Canada, Japan and Mexico. Sherlocks have been popping up from around the world on social media, with Sherlock fans posting #sherlockselfie pics to help raise awareness of brain research and the world record attempt. Pictures have been posted from the Great Wall of China, from Australian beaches, and outside 221B Baker Street itself. The new research centre will help deal with life-limiting brain conditions, including Parkinson’s disease, epilepsy, multiple sclerosis and dementia. The centre will conduct research for patient benefit and will help scientists find new treatments and drug therapies. By 2030 there will be a 20% increase in Parkinson’s alone, a disease that we’ve seen take its toll with Robin Williams, while numbers of dementia patients are expected to soar by 80%.